Over 200 tasty recipes – from appetizers to meal-makers. Plus stocks, noodles, and dumplings from scratch. Delicious soups and stews for every occasion. With special “adapt-it-yourself” recipes for cream of vegetable soup, cold fruit soup, and stew and stock from on-hand ingredients. 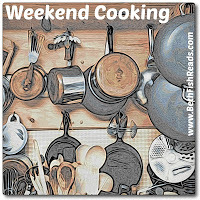 Bonus – sensible tips to help you take shortcuts, make substitutions, and serve soups with flair. With colder weather about to hit us, soups and stews are always a hit. There are tips throughout the book. I loved soup when I was a kid and have eaten Sirloin Burger Soup and Beef Stew on and off as an adult, but I’ve only in the last few years started liking soup and stews again. This cookbook has so many recipes that sound really good, but also a bunch that I’ve never heard of before and sound some that sound a bit strange. For example, there is a recipe for a Salami-Bean Chowder and Apple Raisin Soup which are hot soups. Cherry Wine Soup, Cottage Cheese-Tomato Soup and Orange- Apricot Soup which are cold soups. Some of the other stranger ones are Chicken Cider Stew, Lentil-Pepperoni Soup and Chilled Beet Soup. Yuck!! I can’t stand beets. Anyway, there are beautiful photos throughout the book and I think this is going in my permanent cookbook collection. My husband loved Brunswick Stew, and there is a regular recipe in this book and a quick version. I’m going to share the quick version since that’s the one I’d make. In a large saucepan cook onion wedges in cooking oil until tender but not brown. Bring mixture to a boil and reduce heat. Cover and simmer for 10 minutes. Carefully stir in the chicken and continue cooking until heated through. We love soups and stews around here, especially in the winter. What a classic! I could eat soup every day, I think. Yumm. I’m one of those people who loves beets — and cold borscht is a favorite of mine. The Brunswick Stew sounds delicious! As the weather is getting colder I’m getting more and more interested in stews and soups and this looks like a tasty recipe to add to my collection. I love soup and make a different kind almost every week… this week I made it twice! Vintage cookbooks are so much fun to look through. I would expect a can of ‘cream of something’ soup in most of the recipes from that time. The Brunswick Stew sounds delicious. 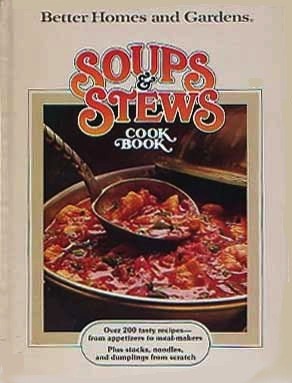 This book looks interesting — always on the lookout for more soups and stews especially now that cooler weather is here. Thanks for the recipe. Perfect weather for this stew! We are currently having higher than normal temperatures but this stew recipe may still make it on to our table for lunch today. Great review! I hate beets, too! I’ve marked my crockpot cookbook up with recipes I want to make now that the weather has gotten cooler. My husband doesn’t like any recipes that call for canned soup (too many mystery casseroles growing up in a family of eight!) so I guess I won’t try the Brunswick stew, but it sounds tasty! Thanks for the mention of Chicken Cider Stew from this cookbook. I used to make it a lot- a favorite of my husband and I. I hadn’t made it in awhile and couldn’t remember which cookbook it was in until I googled it and found your mention. You should try it!